BW = Ben Ward, JB = John Breslin, IT = Isao Tomita. Interpreted by Atsuko Makita. London, 24 June, 1999. <BW> We have received many e-mails from people around the world, saying how your music has inspired them creatively, especially in the field of electronic music. <IT> Thank you very much to everyone. <BW> At the Tale of Genji concert, you were using a Roland JP-8000 'virtual analogue' synthesizer on stage. How do you feel about this new generation of instruments? <IT> If you drink 100% pure alcohol, it tastes of nothing, but a fine wine is something else altogether, it's the 'spice'! So when I use the Moog synthesizer, for instance a module such as a Voltage Controlled Filter, it works as the spice, and this helps to impart the characteristics of those who use that synthesizer. To use another example, mineral water might be from Japan, Switzerland or England, but the water is 100% chemically pure H2O, it has no taste at all. Big efforts are being made by digital synthesizer manufacturers to cut down on noise, but to me, noise can work as a useful element of my sound. <BW> Do you still own the big synthesizers on which you made your early recordings, such as the Moog IIIP and System 55? <IT> Yes, I've kept those instruments, but these days when I am making a recording, I use samplers and other digital recording techniques, because each time I make a new sound, I have to start right from the beginning. This is a limitation of the Moog. I use [DigiDesign] ProTools, StudioVision and some large hard drives - I used this system at the concert. <BW> Do you still also have your Roland System 700 synthesizer? <IT> Yes, that one also. When I was young, and I started out using instruments such as the Moog, it would take me maybe three days to make just one sound. Nowadays, with the advances of digital technology, it might take only an hour. But because of my age [Tomita-san is 67], I just don't have the time to spend three or four days on one sound! You know, in the old days, sounds could turn out very 'fuzzy' and imprecise, but that is ultimately a good thing, I think, and adds to the character of the music. To give an example, on the Moog, the note 'C' in one octave will be accurate, but one octave higher, and the tuning is not exactly precise. This actually turns out to be a good thing, as it provides a chorus effect. I don't think that this same effect can be obtained in the same way using really high-tech digital equipment. 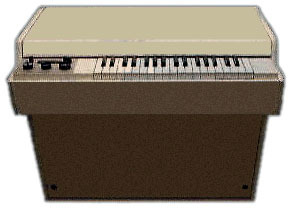 <BW> Regarding the Mellotron, did you process the audio signal through the Moog filter? In what other ways did you use this instrument? <IT> When I used the Mellotron, I would work like this. I would generally use a two-track tape recorder. Following the score, on one track I would record a description of when a certain key for a certain note should be depressed and released. Then, using an envelope follower on the Moog (which picks out the 'shape' of a note, and then uses this information to control a synthesizer), I would feed the Mellotron signal into the Moog, and set up the envelope controls [Attack/Decay/Sustain/Release (ADSR)] to 'play' the Moog, which would follow the notes I played on the Mellotron. An example of the use of this is the opening of 'Pictures at an Exhibition'. And yes, the Mellotron was processed through the Moog. <BW> We heard that you used baby powder on the tape transport of the Mellotron. Is this true? <IT> Yes, it is! Because some of the Mellotron tapes were physically quite long, I found out that it would help to make them run more smoothly. But it was definitely not good for the tone of the sound! <BW> What are your feelings about [Walter Carlos'] 'Switched-On Bach'? <IT> Generally speaking in music, there is a maestro and apprentice, or teacher and student when it comes to learning, but when I started, there was no one to advise me - I was a pioneer. But when I listened to Switched-On Bach, I really felt that I could compete as a rival, not a teacher or a student. In my view, the Baroque nature of the piece conveys a line drawing, but I thought that rather than that, I could try and create music with pictures and colour, and that is when I hit upon the idea of using music of the French impressionists, such as Debussy and Ravel. <BW> Did you have a favourite period of music, before this time? <IT> It was really contemporary or modern music of the twentieth century, composers such as Rimsky-Korsakov, Stravinsky, Ravel, Debussy, Respighi. I think that all of these composers create music using different musical 'colours', rather like painting a mural using a great variety of paints. <BW> How did your ideas about making music change, once you started using synthesizers? <IT> Even after composing such pieces as the Tale of Genji, which uses an orchestra as well as synthesizers, I still have a sympathetic feeling towards the music of the French impressionists, particularly Ravel's 'Daphnis et Chloe'. French composers of the period are somehow different from their contemporaries in other countries, and that might be due to the influence of Japanese court music, which was heard at the Great Exposition in Paris at the turn of the century. I strongly feel that composers such as Debussy and Ravel might well have been influenced by this music, even subconciously. So I feel that I have something in common, some kind of empathy with such composers. <BW> I would really like to hear you do a version of Debussy's 'La Mer'. <IT> Who knows for sure, but in that piece I wonder if Debussy was influenced by those famous Japanese 'wave' paintings?! <JB> When composing, how do you decide whether to use orchestra or synthesizers, or a combination of both? <IT> In a contemporary orchestra, all the instruments are 'complete'. By that, I mean that for instance the French horn is already well developed, so when I would write a part for the horn, I would have to consider whether someone had already written a part in a similar style - had all the avenues been explored? I found this frustrating and depressing, and wondered if there could be a future for the orchestral music as we knew it. At this time (the early 1970's), the Avant-Garde movement was quite well established. Experimental pieces written for instruments such as prepared piano were the norm. But I could see no future for such experiments. Again, I was frustrated! But then I encountered the Moog synthesizer. This really opened the door for me. 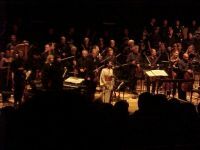 More recently, many offers have been made for me to work with live orchestra again, be it for concerts, television or film, and I realise that maybe there is a future for orchestral music after all. So I really cannot say whether the next piece I work on will be for orchestra only, or synthesizer only or a combination of both. But the possibilities for me are more expanded than ever. <BW> What is your opinion of other synthesizers, other than Moog? What made you choose the instruments you chose? <IT> I don't think there is a big difference between the different makes of digital instruments available these days - if I want a quick and handy solution, I will use one of these instruments. But if I wish to create music for my own sound, I will use analogue, such as the Moog. If I still have the time, and my powers! <BW> Were you involved with the design and development of any specific synthesizers? <IT> I am a consultant to Roland and other corporations, mostly in the development of sounds. This has been the case for some years. <BW> Could I ask, what catastrophes or disasters did you encounter in the early days? <IT> When I acquired my first synthesizer, it took me a year and four months to complete my first recording, 'Snowflakes are Dancing'. I was really pleased with it, and naturally, I was full of confidence that everyone else would like it too. But the reaction from my Japanese record company was "What on Earth is this?!". It's not pop, not classical - there was no convenient category into which they could market it. This was extremely disappointing for me, so I decided to go to New York (though I spoke almost no English! ), where I met a man called Peter Manders at RCA Records, who had heard 'Switched-On Bach' and who I felt sure would listen to the tapes. Peter was very impressed with the tape of 'Snowflakes are Dancing', and the same day decided to release it. I wondered how it would be received, and under what category. I was told that it would appear in the record shelves of both pop and classical - what a change from the reaction in Japan! RCA released the record, and it became a big success in America. I returned to Japan, and some ten months later, my Japanese record company finally released the record. There had been quite a bit of competition amongst Japanese companies to sign me as an artist. To be honest, everyone was rather surprised that I had even come back to see them, after my previous rejection! <BW> What is your favourite piece among your own work? <IT> I really can't say which is my favourite piece of work, because each of them has its own distinct characteristics. Finally, I have a message to everyone, after having given thought to the subject of analogue synthesizers - do not give up, for we are the future. Through analogue synthesizers, you are able to express your own personality and characteristics. As an example, even though it's easy to create a bass sound, real bass cannot be obtained easily. The power of analogue surpasses that of digital, and is best expressed by direct electric current.